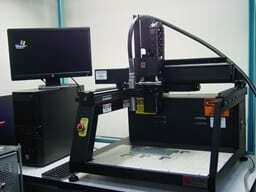 JETEC offers a full line of manual, semi-automatic and automatic label application systems. Choose from low cost label dispensing units to automatic tamp-on or blow-on label systems. For customers requiring a complete turnkey system, including material handling, we can provide systems that properly position your products for automatic labeling. Combine label application systems with industrial ink jet printers to achieve the most flexible corrugated box or product marking system available. Radio frequency identification, or RFID, is a generic term for technologies that use radio waves to automatically identify people or objects. An RFID system consists of a tag, which is made up of a microchip with an antenna, and an interrogator or reader with an antenna. The reader sends out electromagnetic waves. The tag antenna is tuned to receive these waves. A passive RFID tag draws power from field created by the reader and uses it to power the microchip’s circuits. The chip then modulates the waves that the tag sends back to the reader and the reader converts the new waves into digital data. Active RFID tags have a battery, which is used to run the microchip’s circuitry and to broadcast a signal to a reader (the way a cell phone transmits signals to a base station). Passive tags have no battery. Instead, they draw power from the reader, which sends out electromagnetic waves that induce a current in the tag’s antenna. Semi-passive tags use a battery to run the chip’s circuitry, but communicate by drawing power from the reader. 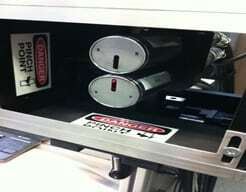 Active and semi-passive tags are useful for tracking high-value goods that need to be scanned over long ranges, such as railway cars on a track, but they cost a dollar or more, making them too expensive to put on low-cost items. Companies are focusing on passive UHF tags, which cost under a 50 cents today in volumes of 1 million tags or more. Their read range isn’t as far — typcially less than 20 feet vs. 100 feet or more for active tags — but they are far less expensive than active tags and can be disposed of with the product packaging. Microchips in RFID tags can be read-write or read-only. With read-write chips, you can add information to the tag or write over existing information when the tag is within range of a reader, or interrogator. Read-write tags usually have a serial number that can’t be written over. Additional blocks of data can be used to store additional information about the items the tag is attached to. Some read-only microchips have information stored on them during the manufacturing process. The information on such chips can never been changed. Other tags can have a serial number written to it once and then that information can’t be overwritten later. JETEC offers OEM and low-cost secondary fluids for most industrial ink jet printers (i.e., Best Code, Domino, Leibinger, Markem-Imaje and Videojet) as well as Mil-Spec permanent and industry specific inkjet fluids. JETEC offers a wide range of industrial ink jet inks. Our Defense Electronics inks provide excellent adhesion to gold plated (electrolytic and electroless), nickel-plated kovar, ceramics, PCBs (FR4, etc. ), plastics, metals (stainless steel, aluminum, anodized and plated, etc. ), glass, vinyl, wood, rubber and paper. Most ink jet inks dry immediately to the touch eliminating potential smearing or print damage. JETEC’s ink jet inks are excellent for bar coding, MIL-STD 130 UID 2D coding, serialization, date coding and product branding. Look to JETEC to assist your company with product diversion and authenticity techniques through the use of advanced product marking techniques. Our team of mechanical, and systems engineers have developed the suite of JETEC Parts Marking Systems to address the product identification challenges most frequently encountered by our customers. 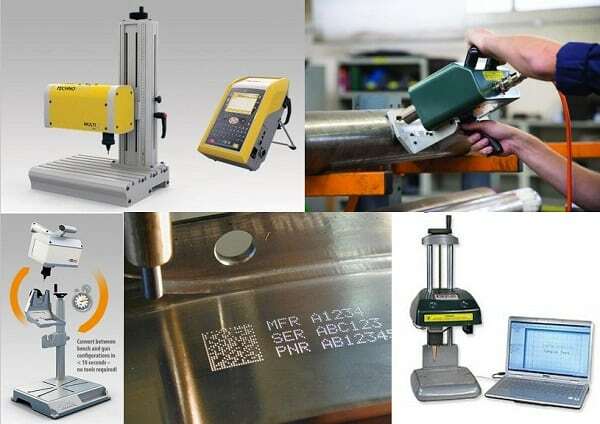 Peening is a permanent direct parts marking (DPM) process used to identify alphanumeric characters, 2D codes (including Mil-Std 130 UID compliant Data Matrix codes), bar codes, custom graphics and logos onto metal or hard surfaces. The process of dot peening encompasses the use of a multiple-axis stylus point which hits the part like a ball-peen hammer and leaves a small dimple. It is an impact marking process that is either electrically or pneumatically driven depending on what material is used. The most common materials used for peening are metals that have hardness ratings up to 62. Other materials such as plastics and hardwoods are good peening candidates. Peening is a relatively inexpensive DPM process, in comparison to laser marking, resulting in no consumables. 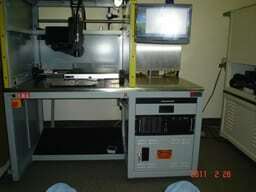 JETEC peening systems comply with SPEC 2000, AIAG, DoD, and DT05-89. JETEC peening systems are ideal solutions for permanent marking of metal and plastic parts, of various shapes and surface conditions. Applications include aerospace and automotive parts identification, metal tags, castings, medical plastic molded parts, etc. Designed for industrial application integration JETEC peening systems can be integrated on production lines or in automatic/semi-automatic assembly or test stations. Choose from turnkey, table-top solutions featuring an integrated PC for peening system control and marking file storage or systems featuring an independent user-friendly control unit (screen & internal software & keyboard) which eliminates the need for a PC or PLC. Peening systems are available that can be PLC controlled. JETEC offers the most comprehensive suite of industrial ink jet printing solutions for direct part marking. Our solutions can include printers from such manufacturers as Videojet, Domino, Markem-Imaje, Leibinger and Inkjet, to name a few. Part marking through automation plus integration allows JETEC to offer solutions for aerospace part marking, serializing, logo printing and JEDEC tray or Auer boat handling. We offer portable handheld marking solutions that are ideal for Boeing BAC5307 and other aerospace part marking specifications. As you scroll down the various inkjet direct part marking systems shown below and don’t see an automated part marking solution suitable for your part marking application we invite you to give us a call. At JETEC we are experienced systems integrators and can configure a part marking solution capable of meeting your specific needs. Remember, If You Can Make It, We Can Mark It! 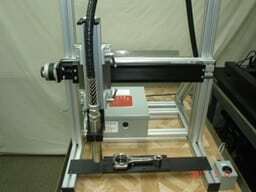 Single axis traverser available in travel lengths from 2” to 48”. Available with single or dual print heads, option 0o to 90o pivoting head. Can be used with IMS2701, IMS5000 or stand alone with industrial ink jet printer. Watch the TMS-1801 in Action Video! High precision integrated closed loop DC servo X/Y system. Available with single or dual print heads. Options include: safety light curtain, 2D code read/verify and fiducial alignment. Ideal for when high precision marking is required. Accommodates most CIJ and DOD print heads. Integrated closed loop DC servo X/Y/Z system. Available with single or dual print heads. Options include: 90o theta, which allows for printing in both the X and Y plane; safety light curtain, 2D code read/verify and fiducial alignment. Ideal for small part, multi-cavity marking or PCBs and microelectronic devices. Watch the TMS-3800 Performing Ink Jet Font Test Video! Watch the TMS-3800 Performing OCRA Font Printing Video! 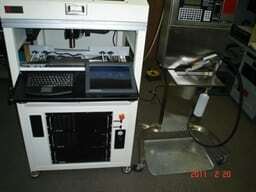 Watch the Electronic Circuit Printing Video! Similar to the TMS-3800 Series but includes an integrated W or rotational axis. 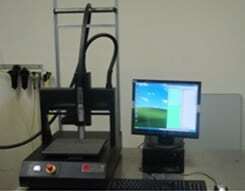 Capable of marking flat parts as well cylindrical parts requiring marking on either the top side of circumference edge. 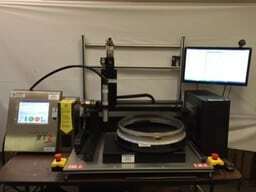 Picture shown is marking a 21” circular aerospace part with a MIL-STD 130 UID 2D code. IMS5000 Rotary software controlled. Watch the TMS-4800 Rotary Marking Video! DC servo based X/Y/Z systems available with 8” x 8” x 3”, 12” x 12” x 4” or 14” x14” x 6” marking envelopes. Ideal for small part marking of microelectronic devices, PCBs or medical devices. Features JETEC’s IMS5000 marking software. Watch the Orion Marking with JET3 Printer Video! This precision marking system is ideal for defense electronics and other direct product marking applications. It features a 18” x 12” marking envelope and is capable of marking in both the X & Y plane. Options include integrated vision, UID or bar code read and verification and variable theta. Controlled with JETEC’s IMS 5000 software. Watch the LMS Printing Font Test Video! 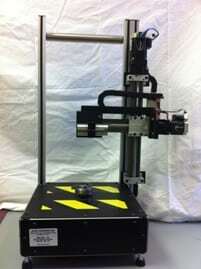 3 Axis DC stepper controlled rotary marking system. Ideal for top side marking around the curve of a cylindrical part or around the circumference. Features auto ink jet head positioning thus reducing part changeover set-up times. Includes a 3 jaw chuck assembly, foot switch and JETEC’s IMS Rotary Marking Software. Ideal for aerospace or automotive DPM applications where small parts are presented to the handheld gun assembly for marking, or for large parts, requiring the gun assembly to be brought to the stationary part. 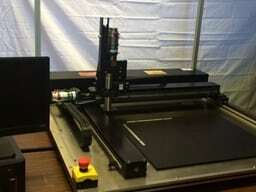 Capable of printing 1 – 5 lines of information in a single marking cycle. Flexible and mobile, this configuration provides a full 4” x 2” marking envelope. 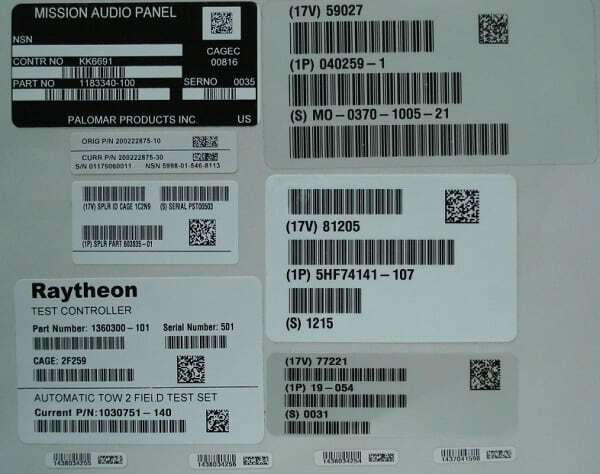 Our IMS5000 software provides the capability to print alphanumeric text, MIL-STD 130 compliant UID codes, logos and bar codes and Windows fonts on to your aerospace, automotive or defense related part assemblies. You can bring the parts to the gun, place the gun in the table and print upwards or take the gun to the large parts. Watch the Flex-A-JET 8400 Deep Pocket Marking Video! 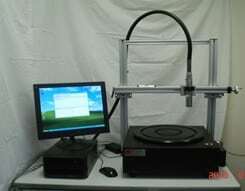 Similar to the Flex-A-JET 8400 series this system features dual ink jet print heads. Ideal for applications where more than one color is needed to satisfy the marking requirements. Each print head has a marking envelope of 4.0” x 2.0”. Watch the Flex-A-JET 9400 Dual Color Printing Video! Designed for PCB applications, this system features a 36” long SMEMA conveyor and is available with up to 2 ink jet print heads. Can easily accommodate PCBs ranging in size up to 18” x 18”. Capable of printing date codes, bar codes, logos, serial numbers and UID 2D codes directly on to single or multi-up panels. Available for inline or offline operations, this system can accommodate panels ranging up to 24” x 18”. Software is capable of reading a MRC on the panel, obtaining information from your ERP system and then printing and verifying the individual boards. Options include: fiducial alignment, bi-directional printing, integrated bar code or UID verification and PCB stackers and destackers. Designed for both small run or continuous high volume jobs, JETEC’s Contract Marking Services provides production operations with direct product marking capabilities, when you need them. Optimize your manufacturing operations, reduce re-work and improve quality consistency with direct product marking and JETEC’s Contract Marking Services. Watch the PCB Inkjet Tape Test Video! Watch the PCB Pass Thru Mode Option Video! Watch the PCB Inkjet Alcohol Resistance Testing Video! LMS, Orion, TMS & RMS are the core of JETEC’s tabletop marking solutions. Orion & LMS feature closed loop DC servo X/Y/Z axes for marking small & medium parts of varying substrate materials. RMS provides legible, machine readable marks around the circumference or top of cylindrical parts. TMS is a fully customizable table-top solution. 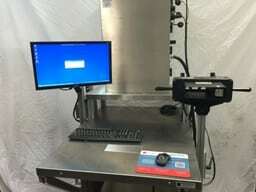 Flex-A-Jet is JETEC’s mobile marking station ideal for marking parts that due to their size or shape, are best marked by moving the marking system to the part. Using Flex-A-Jet’s handheld gun offering single and dual axes marking capabilities, customers in the Aerospace industry have been able to mark large body, engine and wing components. JETEC designed BMS & Stellar for electronics manufacturers needing to meet MIL-STD 883, 202 or CID A-A-208 specifications. Both systems are ideal for JEDEC tray, Auer boats & PCBs. 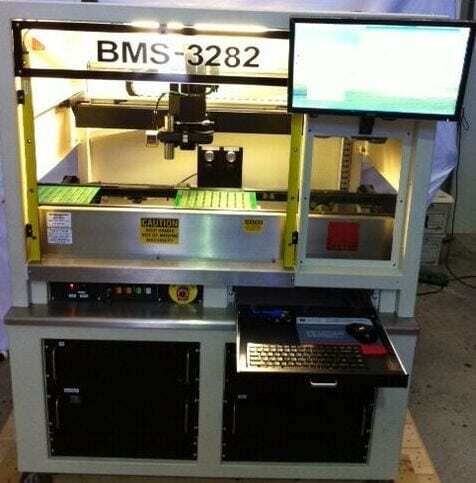 BMS & STELLAR are fully automatic product marking solutions that can facilitate SMEMA conveyor operations, in-line UV curing and vision verification. JETEC’s Galaxy and Eclipse systems have been designed specifically for high resolution Piezo-electronic printer applications. Eclipse has been designed for low volume/high mix environments. Galaxy is a high volume solution that integrates easily into fully automated production environments. Both systems can accommodate multi-part fixtures. JETEC Corporation offers direct product marking solutions designed for both small run or continuous high volume jobs across a wide range of worldwide industries, including manufacturing, pharmaceutical, medical, aerospace, automotive, and more.